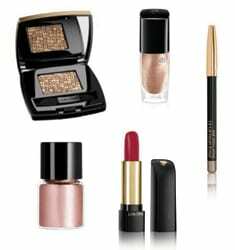 Lancôme has introduced its Christmas collection, which contains products in three golden variations: golden taupe, golden bronze and golden garnet. The range includes Ombre Hypnôse Mono eye shadow, £18.00; Ombre Les Paillettes aux Yeux, a loose powder which can be applied to lids, £17.50; L’Absolu Rouge lipsticks in three shades, £21.00; Vernis in Love nail lacquer, £12.00; and Le Crayon Khôl in a metallic hue, £16.00. The new limited edition collection will be available at Lancôme counters nationwide from 1 November.